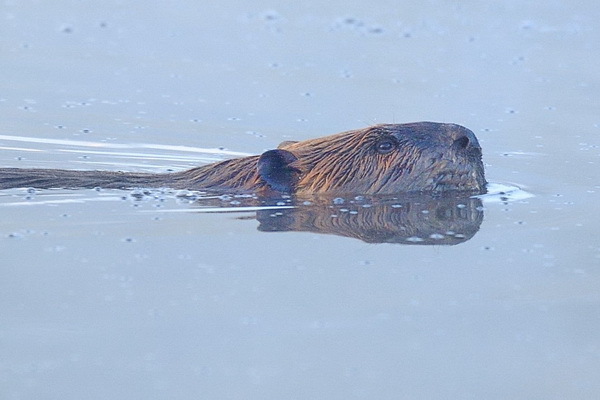 About this same time two years ago our picture of the week was of a beaver that had taken up residence in Lake Van Norden. Over those two years we have heard from many people about their own sightings of the industrious rodent out in the lake and wetlands. Last year while on one of our many paddles out on the lake, my wife Linda thought she saw a “little” beaver swimming around in the shallows. No one else in the group saw it and we never got a picture so this sighting was only a tantalizing clue. This time of the year is one of the best for catching great sunrises over Lake Van Norden and so I have been spending many of the dawns at the dam spillway for the last week. It turns out that dawn is the best time to catch the beaver coming back to it’s lodge after a hard nights work. So I was not surprised when I spotted the tell tale streak on the glassy surface of the lake that told me the beaver was coming home. What did surprise me was that the beaver seemed to have lost a lot of weight. I have seen the beaver pretty close up over the years and it is a good sized adult. What I was seeing however was an animal only about a third of the size. It immedicately became clear that this was in fact a different beaver and obviously much younger. Linda’s sighting was confirmed, there now appeared to be a family in the meadow. About 5 minutes later I spotted another streak coming in and again to my surprise it was not an adult but another young beaver. It was not until about 20 minutes later that the adult (I presume mom) finally came back to the lodge. The following day at sunrise, I observed the exact same chain of events. 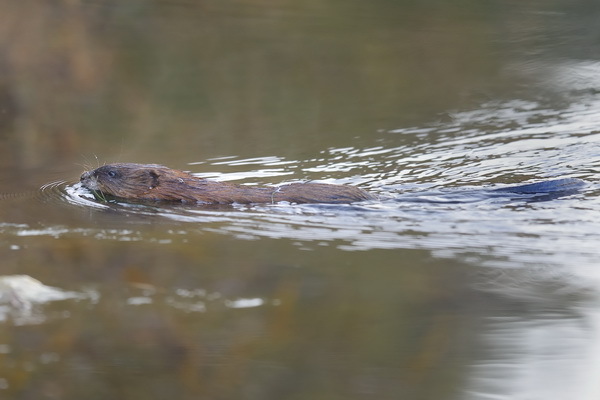 I have heard from many of the old-timers that they used to see beaver out in the Summit Valley in the past. It looks like there is now a well established family living in the lake taking advantage of all that yummy willow that grows in the wetlands. So you might want to keep an eye out if you’re down by the lake (especially early in the morning) to spot one or more of the lakes largest residents.